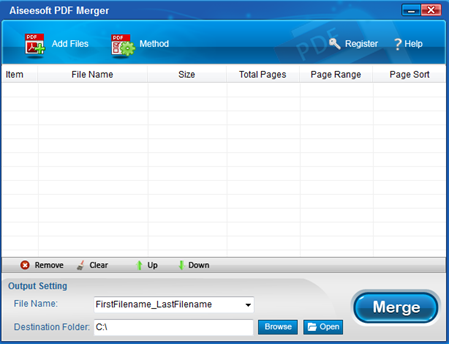 Aiseesoft PDF Merger is a powerful PDF merging software on Windows. It merges many PDF documents into one or many parts in a PDF file into a new PDF file by merging and supports 190 languages using OCR technology. The Aiseesoft PDF Merger interface consists of options to add files, and methods of merging the PDF files, filename customizing, Destination specification and options to Help and Register. PDF Merger gives the option to add files that are needed to be merged. You can add two or more files and they execute in batch processing to merge into a single PDF document. There is no option to drag and drop files. If this drag and drop feature is added it helps to easily place required documents that are to be merged. You can move the files in the order of your preference to be placed in the new PDF document. You can clear the whole list of PDF files or remove a single file of your choice from the list. When merging more files, the page numbers are retained from the previous original files in the new PDF merged document. Embedding this new feature helps to make the PDF merged document more accurate. This software allows user to selectively merge the pages in a PDF file like the first page, last page, a range of pages, continuous odd pages in the PDF to be merged or continuous even pages in the PDF to be merged, pages in reverse order or in sequence, and merge all PDF files alternately or mix pages by every few pages and repeat. It is like splitting the highlighted parts in the source file and merge into a new PDF file. The selective merging mode keeps it apart from other software’s on the market. The output filename can be customized, or select the output file name from the list as “FirstFilename_LastFilename” or “LastFilename_FirstFilename” from the drop down menu. The destination folder can also be specified. Most common input file formats like html/ txt/ jpeg/ bmp/ png/ gif/ rtf/ doc/ docx/ xls/ xlsx/ webarchive are not supported by Aiseesoft PDF Merger. The only input format supported by this software is pdf. There is no specific option to view the new PDF file that is merged in the software itself. However, after the merging, a dialogue prompt appears to ask if the output PDF file needs to be opened. If “yes” is selected then new merged PDF file is opened in a separate PDF viewer software like Adobe. It would be a good addition if PDF viewing is also provided to view the merged PDF file. Aiseesoft PDF Merger cannot be used for editing PDFs. Creating and editing your own digital signature is also not supported. Editing features like page numbering, header & footer, font attributes like style, size, cut, copy, paste, delete are not supported. OCR (Optical Character Recognition) technology feature supports 190 languages like German, French, English, Arabic, Chinese etc. but there is no feature supporting the conversion where a scanned document can be converted into editable and searchable PDF document. Aiseesoft PDF Merger version supports converting PDF files into PDF files only after merging. It does not convert into normal output formats like Word, Image, Excel, etc. PDF/A format which is an ISO standard output format for long-term archiving is not supported. This PDF Merger software cannot convert PDF directly from a scanner. It can take only PDF files as input and cannot convert them into file formats like Excel, Word, HTML etc. It will only convert PDF files into PDF files only. Password protection option is not present to prevent the merged document to be accessed by unauthorized users. The merged PDF document can be edited, copied, oriented or extracted by unauthorized users as their usage cannot be restricted by applying permissions. Confidential and sensitive data cannot be searched and redacted by this software. The new merged PDF document cannot be saved to cloud storage like Google Drive, Drop Box or even shared via email attachment directly from the software interface itself. There is also no option to digitally sign the document or to watermark it. The lifetime price for a single license is onetime payment of $25. Free lifetime updates are provided. For ordering custom products and batch purchase a quote can be requested. All major credit cards are accepted including wire transfer. A 100% security is guaranteed. They provide 24/7 Customer Support. A trial version is given with limitation until 15 days and merges only 5 times each day. The Help tab gives options to Purchase, Register, Help Center, Support, Home Page and About. The options Purchase, Support, and Home Page are routing to another software web page called “DVD Creator” of Aiseesoft itself than routing to their respective web pages. The option displays a prompt for User Name and Registration Code to access the full benefits after purchasing where a code and user name are provided for registering. The Help Content option tab opens a user guide where you can know how to use the software and merge the PDF files. Technical support is provided by email but live chat facility is not provided. User guide itself is very clear in explaining the working of the software bit by bit. 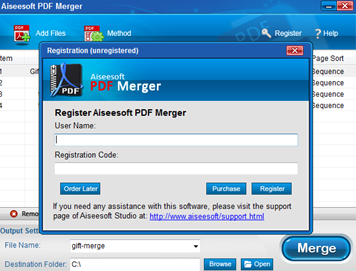 The support page on the website is common for all the other software’s that Aiseesoft provides along with PDF Merger software. It would be good if they have a support page for every software separately, so it would not be confusing for the users. Aiseesoft PDF Merger software runs on Windows operating systems like Windows Vista, Windows 7, and Windows XP, Windows NT4, Windows 2000, and Windows 2003 per the user guide but the website says that it is compatible with Windows 10/8/7/Vista and XP.